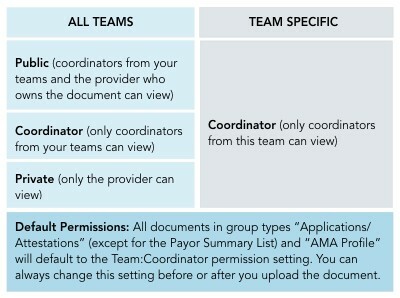 All documents in group types “Applications/Attestations” (except for the Payor Summary List) and “AMA Profile” will default to the Team:Coordinator permission setting. You can always change this setting before or after you upload the document. Ever started adding a provider’s education details, only to realize that you chose Medical School instead of Undergrad? Now all entries into the Education & Training section will ask you to select the school type (e.g., Nursing School) before you continue with the record. Just click the Add button to start a new entry of any type. We’ve added yet another new one, the American Board of Medical Genetics and Genomics. If you work with a large team, you’ll appreciate this one – you can now filter your invite list by provider tags. Enter the tag into the field to have only the new providers with those tags pre-selected for your invite list. Providers: There’s a new column “CAQH Status” in this report. We want to make sure you can track all your providers at any time. Now, if you view a tracking report for an inactive provider, their name will be in red.